The antimetabolite mangotoxin is a key factor in virulence of Pseudomonas syringae pv. syringae strains which cause apical necrosis of mango trees. 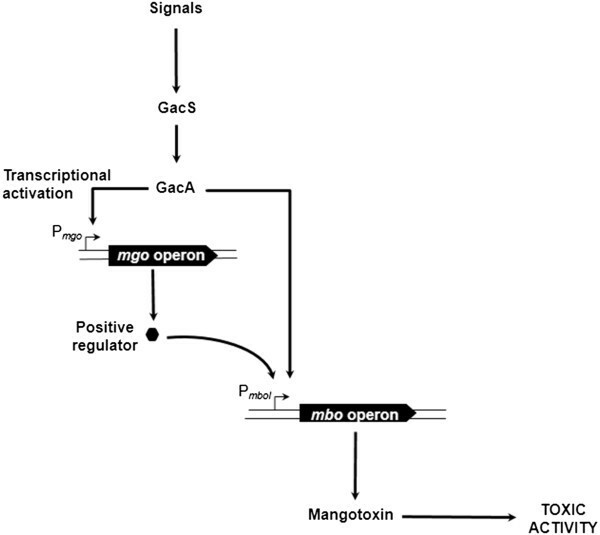 Previous studies showed that mangotoxin biosynthesis is governed by the mbo operon. Random mutagenesis led to the identification of two other gene clusters that affect mangotoxin biosynthesis. These are the gacS/gacA genes and mgo operon which harbors the four genes mgoBCAD. The current study shows that disruption of the nonribosomal peptide synthetase (NRPS) gene mgoA resulted in loss of mangotoxin production and reduced virulence on tomato leaves. Transcriptional analyses by qPCR and promoter reporter fusions revealed that mbo expression is regulated by both gacS/gacA and mgo genes. Also, expression of the mgo operon was shown to be regulated by gacS/gacA. 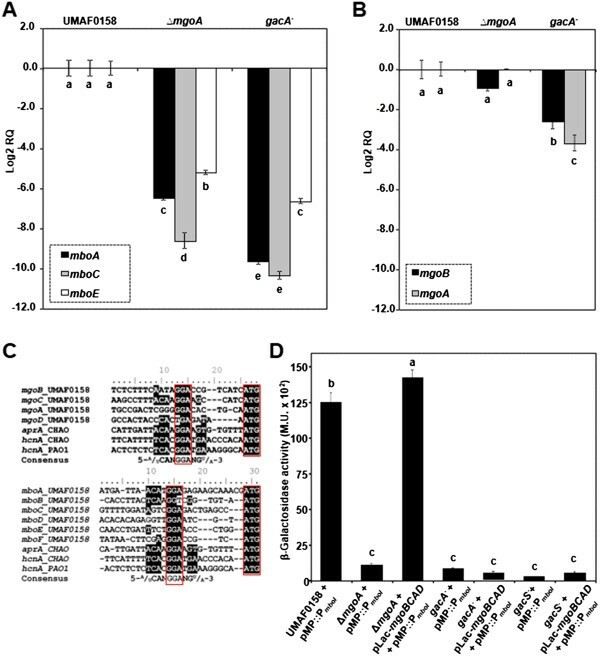 Heterologous expression under the native promoter of the mbo operon resulted in mangotoxin production in non-producing P. syringae strains, but not in other Pseudomonas species. Also introduction of the mbo and mgo operons in nonproducing P. protegens Pf-5 did not confer mangotoxin production but did enhance transcription of the mbo promoter. From the data obtained in this study, we conclude that both mbo and mgo operons are under the control of the gacS/gacA two-component system and that the MgoA product acts as a positive regulator of mangotoxin biosynthesis. Pseudomonas syringae is one of the most ubiquitous plant pathogens, causing various economically important diseases . The present study focuses on P. syringae pv. syringae UMAF0158 (CECT 7752) which causes apical necrosis of mango [2, 3]. The antimetabolite mangotoxin is a key virulence factor of strain UMAF0158 [4, 5]. This toxin is produced in the early exponential growth phase and inhibits ornithine N-acetyl transferase, a key enzyme belonging to the ornithine/arginine biosynthetic pathway . Random mini-Tn5 mutagenesis followed by cloning, sequencing and heterologous expression recently led to the identification of the gene cluster that governs mangotoxin biosynthesis . The mbo operon (m angotoxin b iosynthetic o peron) is composed of six genes, mboABCDEF. Disruption of each of these genes resulted in mangotoxin deficient mutants and constitutive expression of the mbo operon in non-mangotoxin producing P. syringae strains conferred mangotoxin production . Screening of the random mutant library also led to the identification of several other genes that may be involved in the regulation of mangotoxin biosynthesis . These included the gacS/gacA genes and the so-called m angotoxin g enerating o peron mgo[6, 7]. The GacS/GacA two-component regulatory system is highly conserved in Gram-negative bacteria and is involved in a variety of functions, including pathogenicity , quorum sensing [9, 10], secondary metabolite production [11–14] and biofilm formation [15–17]. In Pseudomonas syringae, the GacS/GacA two-component system regulates the production of the phytotoxins syringomycin and syringopeptin [18–20], tabtoxin [21, 22] and phaseolotoxin . In P. syringae pv. tomato DC3000, GacS/GacA regulate the hrpR, hrpS, and hrpL genes, which are required for the activation of the Hrp type III secretion and effector genes [24, 25]. However, in P. syringae pv. syringae B728a, GacA appears not to be required for hrp gene expression . The mgo operon is composed of four genes, mgoBCAD[4, 7]. Mutants in each gene belonging to the mgo operon showed an alteration (mgoB mutant) or lack of mangotoxin production (mgoC, mgoA and mgoD mutants). These genes encode for different hypothetical proteins with predicted domains for a haem oxygenase (MgoB), a p-aminobenzoate N-oxygenase (MgoC), a nonribosomal peptide synthetase (MgoA), and a polyketide cyclase/dehydrase or lipid transporter (MgoD) [4, 7]. The predicted amino acid sequence of MgoA suggests only one amino acid activation module and 14 conserved domains, including aminoacyl adenylation, condensation, thiolation, and additional reduction domains . Genes homologous to the mgo operon have been found in the genomes of most Pseudomonas spp., with the exception of P. protegens Pf-5 and CHAO [26, 27]. Recent studies on the pvf gene cluster in P. entomophila, a homologue of the mgo operon, suggested that it affects virulence . Almost all the fluorescent Pseudomonas spp. lack the mbo operon [29, 30], but the mgo operon is conserved in all of them (except P. protegens Pf-5) [4, 7, 26–28]. To date, however, the functions of mgo operon are yet unknown. The overall objective of this study was to get insight into the role of the mgo operon in regulation of mangotoxin production in P. syringae pv. syringae UMAF0158 and unravel the interplay between mgo, mbo and the gacS/gacA two-component regulatory system. The wild type strain P. syringae pv. syringae UMAF0158 (CECT 7752) and the collection of selected derivative mutants used in this study (Table 1) were grown on Pseudomonas agar F (Difco) plates, in liquid King’s medium B (KMB)  or in Pseudomonas minimal medium (PMS)  at 28°C. Escherichia coli strain DH5α was used as a host for plasmid complementation experiments. It was routinely grown on Luria-Bertani (LB) plates or in LB broth at 37°C. Antibiotics for selection of P. syringae pv. syringae UMAF0158 and E. coli derivatives were ampicillin (100 mg L-1), kanamycin (50 mg L-1), gentamycin (30 mg L-1) or tetracycline (25 mg L-1). aCECT: Spanish Type Culture Collection, Spain. Antimetabolite toxin production was assayed by the indicator technique previously described . Briefly, a double layer of the indicator microorganism E. coli CECT 831 was prepared; after solidification, the P. syringae pv. syringae strains to be tested were stab-inoculated. The plates were initially incubated at 22°C for 24 h, and then at 37°C for an additional 24 h . To evaluate mangotoxin activity, the same plate bioassay was carried out with the addition of 100 μl of a 6 mM solution of N-acetyl-ornithine or L-ornithine to the double layer of E. coli. To determine growth characteristics of representative strains, the wild type mangotoxin-producing P. syringae pv. syringae UMAF0158 and derivatives mutants in mboA, mgoA and gacA genes were used to obtain initial cultures in 10 ml of LB broth. The bacterial strains were grown during 24 h at 28°C to prepare an optimal bacterial inoculum with an optical density of 0.8 at 600 nm (approximately 109 cfu ml-1). One ml from these bacterial inocula was used to inoculate 100 ml of PMS broth. The cultures were incubated at 22°C under orbital shaking at 150 rpm until the stationary phase. Samples were collected every 6 or 12 h to monitor the bacterial growth. Bacterial cfu per sample were determined by 10-fold serial dilutions on KMB plates. At the same time, the mangotoxin production assessment was performed by a cell-free filtrate dilution sequence at 50%. The mangotoxin production is measured using arbitrary units, which can be defined as the relative toxic volume of cell free filtrates of liquid cultures, which produces an inhibition halo of 18 mm in diameter under standard assay conditions . The methodology presented a detection threshold of 0.5 toxic units, due to the diameter of the wells where the cell-free filtrate were deposited (9 mm). DNA fragments of approximately 7 kb containing the mgo and mbo operons, including the promoter and terminator regions, were obtained by PCR using specific primers (Additional file 1: Table S1) and high fidelity polymerase (Phusion DNA polymerase, Finnzymes). The PCR amplification products were cloned in pGEM-T Easy (Promega), and the plasmids obtained were digested with Xba I for the mgo operon and with EcoR I and Pst I for the mbo operon. After the digestion, both operons fragment were obtained from gel with the NucleoSpin kit (GE Healthcare) and cloned into the correspondent shuttle vectors, pBBR1MCS-5  for the mgo operon and pMP220  for the mbo operon, which were digested, dephosphorylated (shrimp alkaline phosphatase; Promega), and purified with the NucleoSpin kit according to the manufacturer’s instructions. E. coli DH5α was transformed with the plasmids obtained, by heat shock transformation , and transformed colonies were selected on LB agar plates supplemented with gentamicin (30 mg L-1) in the case of pBBR1MCS-5 and tetracycline (25 mg L-1) for pMP220. Plasmids with the mgo and mbo operon cloned were obtained (Table 1). Correct integration and orientation of the fragments was verified by PCR and restriction analysis of isolated plasmids (data not shown). The pLac-mgoBCAD construct was subsequently electroporated into the mboA, mgoA and gacA mutants, and the wild-type strains P. syringae pv. syringae UMAF0158 and P. protegens Pf-5. The pMP-mboABCDEF construct was transformed in P. protegens Pf-5 which previously contain the pLac-mgoBCAD, therefore this bacteria finally harbored both operons, the mgo and mbo operon. Transformed cells were selected on KMB agar supplemented with correspondent antibiotics. The presence of the different plasmids was confirmed by PCR analysis with specific primers for pBBR1MCS-5 and pMP220 and plasmid profiling. The virulence of different mangotoxin producing or non-producing P. syringae pv. syringae strains were analyzed in detached tomato leaflets (Solanum lycopersicum Mill.) cv. Hellfrucht Frühstamm maintained in vitro using Murashige and Skoog medium (MS, Sigma-Aldrich) [4, 5]. Bacterial suspensions from exponentially growing cultures were adjusted to 108 cfu ml-1. The leaflets were inoculated by placing six 10 μl drops of the bacterial suspension on six different points on the same leaflet. Inoculations were then carried out by piercing through the droplets with a sterile entomological pin. The leaflets were maintained in MS media at 22°C and a 16:8-h light: dark photoperiod. Six tomato leaflets were used to evaluate each strain. Detached leaflets only inoculated with sterile distilled water were included in all experiments as a control. These experiments were repeated three times. The development of necrotic symptoms at the inoculation points (n = 108) was determined after 10-day. The severity symptoms were evaluated by the analysis of the total necrotic area per leaflet induced by the inoculated strains after 10 days of incubation. For severity measurement, the necrotic areas of the inoculation points were digitally analyzed on the six leaflets, using the computer image software VISILOG 5.0 (Noesis Vision Inc.). At the same time, two inoculated leaflets were used to estimate the daily development of the total bacterial population. For that purpose, whole tomato leaflets were homogenized in sterile water and bacterial counts were determined plating by 10-fold serial dilutions on KMB plates. Bacterial growth inside the plant tissue was recorded after H2O2 leaf surface disinfection. Colony counts growth based on the typical morphology of P. syringae pv. syringae UMAF0158 were recorded after incubation at 28°C for 48 h.
From PMS cultures described above, cells from 2 ml cultures were collected and spun down at 12,000 rpm (1 min) from the wild type strain and the derivative mutants in gacA and mgoA. The cells were frozen in liquid N2 and stored at -80°C. For the RNA isolations and cDNA synthesis, three biological replicates were used for each time point. For the transcriptional analyses, RNA was isolated from the frozen bacterial cells with Trizol reagent (Invitrogen), followed by DNase I (GE Healthcare) treatment. One μg of RNA was used for cDNA synthesis with Superscript III (Invitrogen) according to the manufacturer’s protocol. For the real-time quantitative PCR (Q-PCR), conducted with the 7300SDS system from Applied Biosystems, the SYBR Green Core kit (Eurogentec) with a final concentration of 3.5 mM MgCl2 was used according to the manufacturer’s protocol. The concentration of the primers was optimized (400 nM final concentration for all of them), and a dissociation curve was performed to check the specificity of the primers. The primers used for the Q-PCR are listed in Additional file 1: Table S1. To correct for small differences in template concentration, rpoD was used as the reference housekeeping gene. The cycle in which the SYBR green fluorescence crossed a manually set cycle threshold (C T ) was used to determine transcript levels. For each gene, the threshold was fixed based on the exponential segment of the PCR curve. The C T value of mboA was corrected for the housekeeping gene rpoD as follows: ∆C T = C T (mboA) - C T (rpoD); the same formula was used for the other genes studied. The relative quantification (RQ) values were calculated by the following formula: RQ = 2− [ΔCT(mutant) − ΔCT(wild type)][39, 40]. Q-PCR analysis was performed in duplicate (technical replicates) on three independent RNA isolations (biological replicates). To study the mbo operon expression in different genetic backgrounds, the mbo operon promoter (P mboI ) cloned into pMP220  as previously described  was used. The derivative mutants in mgoA, gacA and gacS genes were transformed with plasmid pMP::P mboI which contains the P mboI . The plasmid pLac-mgoBCAD (harboring the mgo operon) was also used to complement the mgoA, gacA and gacS mutants and finally the β-galactosidase activity of P mboI was measured. In order to evaluate the effect of the mgo operon on the activity of P mboI , P. protegens Pf-5 was used due to the absence of the two operons in its genome. First, P. protegens Pf-5 was transformed with the pMP::P mboI and the promoter activity was measured, and secondly to measure the effect on the mbo operon transcription, this strain containing the plasmid pMP::P mboI , was also transformed with the plasmid pLac-mgoBCAD (mgo operon under pLac regulation). As a negative control the β-galactosidase activity was measured for the wild type strain P. syringae pv. syringae UMAF0158 and each strain used in this assay, transformed with empty vector pMP220. β-galactosidase activities were quantified by the Miller method . Briefly, an overnight culture obtained as previously described in growth curve and toxins assay section were prepared. The samples were collected at 18 h, and the cells were harvested and suspended in assay buffer to eliminate any error in the detection of β-galactosidase activity due to the effects of different carbon sources present in the growth medium. The results presented are from three separate experiments, each conducted in triplicate. In order to identify the presence of the mgoA gene in the different genomes of Pseudomonas strains, the mgoA gene from P. syringae pv. syringae UMAF0158 was used in BLASTP  comparisons with whole genome sequences of Pseudomonas spp. available in the databases. Once the amino acid sequences of all the orthologous mgoA genes were obtained, the putative adenylation domains were identified using the PKS/NRPS Analysis Web-site (http://nrps.igs.umaryland.edu/nrps) . Other adenylation domains of which the activated amino acid is already known were obtained from the database and from De Bruijn met al. . Two phylogenetic analyses were done, the first was using the adenylation domain of all the NRPSs (328 residues) and the second was using the almost entire sequence of MgoA (1015 residues). Amino acid sequences were aligned with Muscle (MEGA5 software) and determination of the optimal amino acid substitution model and phylogenetic tree construction were done using MEGA5 software . Neighbor-joining, maximum parsimony and maximum-likelihood phylogenetic trees of the individual gene sequences were generated in MEGA5 by using the optimal model parameters and the option of complete deletion to eliminate positions containing gaps. Confidence levels for the branching points were determined using 1,000 bootstrap replicates. Searches for sequence similarity in the NCBI databases were carried out using BLAST algorithms . Genome and nucleotide sequences were visualized and manipulated using the Artemis genome browser  and compared using ACT  in combination with WebACT . The statistical analysis of incidence was performed by SAS9.2 software (SAS Institute Inc.) by Enterprise Guide 4.2 using generalized linear model analysis. The β-galactosidase and the necrotic area data were statistically analyzed using an analysis of variance, followed by Fisher’s least significant difference test (p = 0.05), and for β-galactosidase activity on P. protegens Pf5, a Student’s t-test was carried out (p = 0.05), using the IBM.SSPS 19 software (IBM® Company). Six mangotoxin deficient mutants of P. syringae pv. syringae UMAF0158, were previously obtained and characterized for mangotoxin production (Table 1 and Figure 1). Mangotoxin characterization showed that although these mutants did not show mangotoxin production, a slight production of a yet unknown antimicrobial compound was observed for mutants 4βA2 (mboB) and 5αC5 (mboD) (Figure 1). For two mutants (3γH1 and 6γF6), the Tn5 insertion was located in mgoC and mgoA respectively. Two other non-mangotoxin producing mutants were disrupted in the genes encoding the GacS/GacA two-component regulatory system (3αE10 and 2βB7 respectively). Growth of the mgoA mutant was shown to be similar to that of the wild type strain, with cell densities of up to 1011 cfu ml-1 in liquid medium after 108 h of growth at 22ºC (Additional file 2: Figure S1A). In contrast, the gacA mutant presented an altered growth, with cell densities in the stationary phase reaching only 109 cfu ml-1 (Additional file 2: Figure S1A). The dynamics of the mangotoxin production in relation to bacterial growth was followed during four days of incubation. Mangotoxin production was detectable after 24 h of growth, increased up to 1.4 toxic units (T.U. ), then reduced slightly upon entry of the stationary phase and then stabilized (Additional file 2: Figure S1B). Mangotoxin production by random miniTn 5 insertional mutants. Three pairs of mutants in different genes of the mbo and mgo operon, and in the gacS/gacA two-component regulatory system, obtained in previous works and tested for mangotoxin production. The corresponding disrupted gene is detailed in brackets. The P. syringae pv. syringae strains UMAF0158 (mangoxin-producing wilt-type strain) and B728a (nonproducing) were used as references. Mangotoxin production was evaluated using PMS minimal medium supplemented or not with ornithine. The results are indicated as follows: - absence of inhibition halo, + presence of inhibition halo, -* slight toxicity which was not reverted by addition of ornithine. Toxic activity reverted in presence of ornithine denotes the production of mangotoxin. In order to know if the virulence of the derivative mutants mboA- and mgoA was reduced in comparison with the wild type strain, detached tomato leaflets were artificially inoculated. Artificial inoculation experiments using detached tomato leaflets  showed that bacterial growth inside the tomato leaflets of the mboA - and ΔmgoA mutants as well as their complemented derivatives followed similar dynamics (Additional file 3: Figure S2A). When inoculations were performed, development of necrotic lesions was observed on the leaf. Disease severity, represented by the necrotic area, showed that both mangotoxin defective mutants were less virulent than the wild type UMAF0158 (Additional file 3: Figure S2B and S2C). When derivative strains were complemented with the mboA and mgoA genes disease severity increased but complementation did not fully restore virulence to wild type level (Additional file 3: Figure S2B and S2C). To study the role of mgoA and gacA in mangotoxin biosynthesis, transcription of the mboACE and mgoBA genes was analyzed for the wild type strain, and for the mgoA and gacA derivative mutants. Time course experiments showed that the mbo genes in the wild type are expressed at the highest level after 12 to 24 h (Additional file 4: Figure S3). Therefore all comparisons between wild type and mutants were performed at 18 h of growth. Transcript levels of the mboACE genes after 18 h of growth were significantly lower in the gacA and the mgoA mutants than in the wild type (Figure 2A). Also the transcript levels of mgoB and mgoA were significantly lower in the gacA mutant (Figure 2B). The mgoA mutation did not affect transcription of gacS/gacA (data not shown). Also mboA, mboC, or mboE mutations did not significantly affect transcription of gacS/gacA or mgoA (data not shown). These results indicate that the GacS/GacA two-component regulatory system affects transcription of both the mbo and mgo genes and that the product of the mgo operon influences transcription of the mbo genes. To further study if the GacS/GacA two-component regulatory system could regulate the mgo and mbo genes via RNA repressor binding proteins [49–51], the upstream regions of the mgo and mbo genes were inspected for the presence of the described consensus motif (5′-CANGGANG-3′) previously described in P. protegens CHAO . This motif allows the binding of the repressor to the RNA, and these repressor proteins can be removed by Gac/Rsm. The complete consensus sequence was not detected upstream of any of the mbo/mgo genes (Figure 2C). However, consensus GGA motifs for binding of the RNA binding proteins [49–51] were detected upstream of the mbo and mgo operons (Figure 2C). It must be taken into account that the described consensus sequence is from P. protegens, and nothing is known yet about the recognition site of RNA binding proteins in P. syringae. Transcriptional analysis and mbo operon promoter activity. mboA, mboC and mboE (A), belonging to the mbo operon and mgoB and mgoA (B), belonging to the mgo operon transcript levels in the wild type strain P. syringae pv. syringae UMAF0158 and mgoA and gacA mutants. (C) Comparison of the described consensus motif (5′-CANGGANG-3′) for P. fluorescens[49–51]: The search was done in front of each start codon of the mgo and mbo genes. 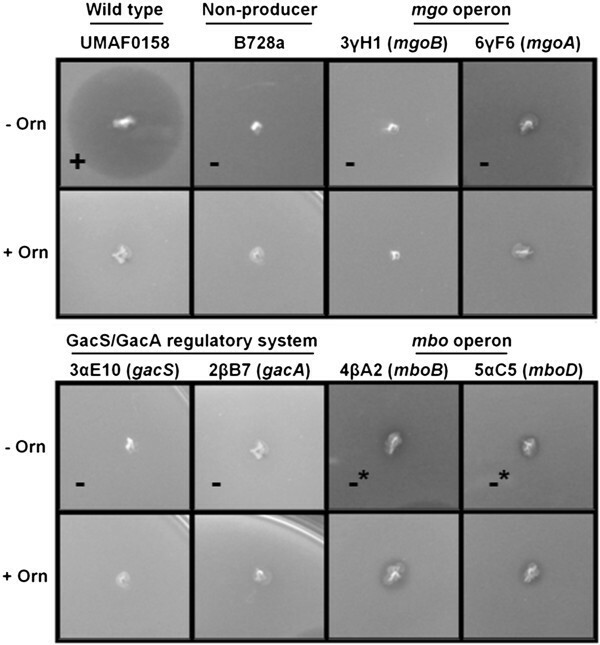 (D) β-galactosidase activity of the mbo operon promoter in the wild-type strain UMAF0158 and mgoA, gacS and gacA mutants. These strains were transformed with the mbo operon promoter named pMP::P mboI and the empty promoter-probe vector pMP220 was used as a control. The different mutants were also transformed with the vector pLac-mgoBCAD. Log2RQ represents the expression levels of the studied genes by relative quantification scores. Values below 0 indicates lower expression than the housekeeping gene used for normalization of data. The results are average of three independent experiments performed in triplicate. Error bars indicate standard deviation. Data were analysed for significance using an arcsine square root transformation with analysis of variance followed by Fisher’s least significant difference test (P = 0.05). Values of bars with different letter designations represent a statistically significant difference. As the transcription of the mgo operon was substantially lower in the gacA mutant (Figure 2B), we subsequently tested whether introduction of extra copies of the mgo operon in the gacS or gacA mutant could restore mangotoxin production. When the mgo operon was introduced in the mgoA mutant mangotoxin production was restored, which was not the case for the mboA, gacA and gacS mutants (Table 2). The results are indicated as follows: - absence of inhibition halo, + inhibition halo between 5-10 mm, ++ inhibition halo bigger 10 mm, -* slight toxicity which did not revert in presence of ornithine. Toxic activity, which reverts in the presence of ornithine, denotes the production of mangotoxin. To further elucidate the role of the mgo operon in the regulation of mangotoxin biosynthesis, expression assays were carried out using a plasmid reporter construction consisting of the mbo operon promoter fused to a promoterless lacZ gene. When the plasmid reporter was transferred into the wild type strain, high levels of β-galactosidase activity were found, whereas for the mgoA, gacA and gacS mutants this activity was substantially lower (Figure 2D). For the mgoA mutant, complementation with the mgo operon restored β-galactosidase activity to similar levels as in the wild type strain (Figure 2D). In contrast, no restoration of the β-galactosidase activity was found when the mgo operon was introduced in the gacS/gacA, confirming results described above (Table 2). The amino acid sequence of a typical non-ribosomal peptide synthetase (NRPS) displays an adenylation (A) domain responsible for recognition and subsequent activation of an amino acid substrate. It also contains the typical thiolation (T) and condensation (C) domains. Finally, the thioesterase (TE) domain releases the final molecule from the NRPS assembly line. Based on the specific signature sequences described previously for A domains, analysis of MgoA did not allow prediction of the amino acid to be activated. 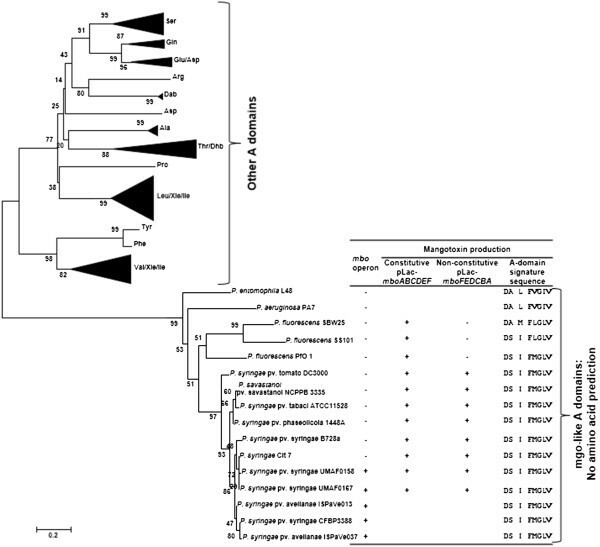 Therefore, a phylogenetic analysis was performed with multiple A domains from NRPSs of which activated amino acids are known and with MgoA from other Pseudomonas species (Figure 3 and Additional file 5: Figure S4). The results showed that the A domains from the different MgoA orthologues grouped in the same cluster, separate from other A domains for which the activated amino acid residue is known (Figure 3). Phylogeny of the MgoA adenylation domain. Neighbor-joining tree, constructed with MEGA5 using the adenylation domains extracted from nonribosomal peptide synthetases involved in syringomycin, syringopeptin, massetolide A, arthrofactin synthesis and mangotoxin biosynthesis (MgoA). The presence (+) or absence (-) of the mbo operon is shown in the phylogenetic tree. The boxes indicate the different groups of Pseudomonas species which are able to produce mangotoxin when were transformed with pLac-mboABCDEF (mbo operon under its own and P LAC promoter expression) or pLac-mboFEDCBA (mbo operon under its own promoter expression). Also is indicated the signature sequence of the adenylation domains in each strain. The evolutionary history was inferred using the Neighbor-Joining method . The evolutionary distances were computed using the JTT matrix-based method  and are in the units of the number of amino acid substitutions per site. The variation rate among sites was modelled with a gamma distribution. The analysis involved 126 amino acid sequences. There were a total of 328 positions in the final dataset. Evolutionary analyses were conducted in MEGA5 . Bootstrap values (1,000 repetitions) are shown on branches. To determine if mgoA present in other Pseudomonas species can regulate the mbo operon, reporter constructs pLac-mboABCDEF (mbo operon under its own and under pLac promoter expression) and pLac-mboFEDCBA (mbo operon only under its own promoter expression) were used. Firstly, only specific P. syringae pathovars harbor the mbo operon, and almost all strains from these pathovars produce mangotoxin , with or without the introduction of the mbo operon containing plasmids (Figure 3). Our results showed that other P. syringae pathovars, that do not contain the mbo operon, are all able to produce mangotoxin when they were transformed with pLac-mboABCDEF and pLac-mboFEDCBA (Figure 3). When different P. fluorescens strains were transformed with either vector, they only produced mangotoxin when the mbo operon was expressed constitutively but not when they were transformed with the mbo operon with its native promoter (Figure 3). To further investigate if the mgo operon is able to regulate the expression of the mbo operon, we introduced the mbo operon promoter reporter construct (pMP::P mboI ) and the mgo genes in P. protegens Pf-5, which lacks both the mgo and the mbo operons in its genome. Compared to the promoter activity in the wild-type Pf-5 background, a two-fold increase in ectopic mbo promoter activity was observed when Pf-5 was complemented with the mgo operon (Figure 4A). When P. protegens Pf-5 was transformed with pLac-mboABCDEF (mbo operon under pLac regulation), it produces mangotoxin. However, when P. protegens Pf-5 was transformed with pMP-mboFEDCBA (mbo operon under only its own promoter expression) it was not able to produce detectable amounts of mangotoxin, neither in absence nor in presence of the mgo operon of P. syringae pv. syringae UMAF0158 (Figure 4B). Therefore, the presence of the mbo and mgo operons in P. protegens Pf-5 would be not sufficient for the production of detectable amounts of mangotoxin. Heterologous expression and production of mangotoxin. (A) The mbo operon promoter activity in P. protegens Pf-5 transformed with the mbo operon promoter (pMP::P mboI ) and with the empty promoter-probe vector pMP220 was used as a control. To check the positive regulation of the mgo operon, the strain Pf-5 was transformed with the vector pLac-mgoBCAD. The result is the average of three independent experiments performed in triplicate. Error bars indicate standard deviation. 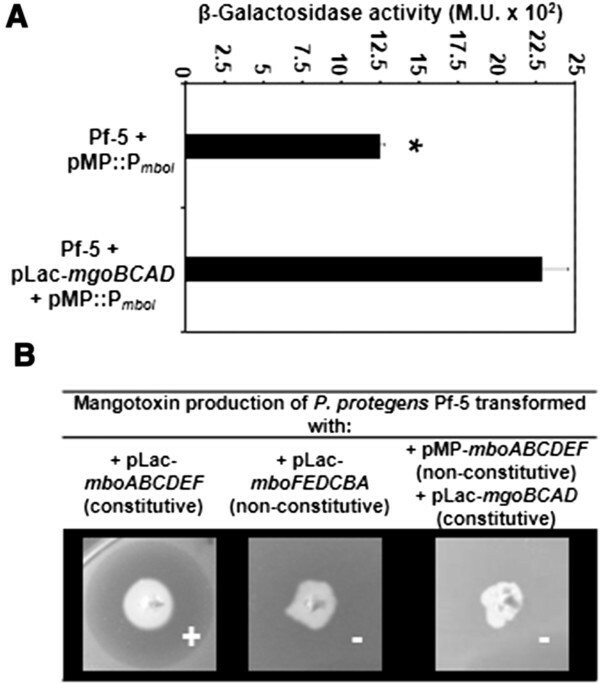 (B) Mangotoxin production of P. protegens Pf-5 transformed with pLac-mboABCDEF (mbo operon under its own and P LAC promoter expression), pLac-mboFEDCBA (mbo operon under its own promoter expression) and pLac-mgoBCAD (mgo operon under its own and P LAC promoter expression) and pMP220-mboABCDEF (mbo operon under its own promoter expression). Data were analysed for significance using a Student’s t-test (P = 0.05). Value of bar with an asterisk designation represent a statistically significant difference to the other bar value. The results of our study show that the regulation of mangotoxin biosynthesis in the plant pathogenic P. syringae pv. syringae strain UMAF0158 is governed by a complex interplay between the GacS/GacA two-component regulatory system, the nonribosomal peptide synthetase mgoA and the mangotoxin biosynthesis operon mbo. We showed that disruption of the mbo biosynthesis genes leads to reduced virulence. Introduction of the mbo operon in these biosynthesis mutants restored mangotoxin production but did not lead to full restoration of virulence on tomato leaflets. Multiple copies of the plasmid with the mbo operon could lead to overproduction of mangotoxin which may affect the regulation or production of other virulence factors such as syringomycin and syringopeptin. Taken together the obtained results of this work and the previously described data [4, 6, 7], a simplified model for the interplay among these genes can be constructed (Figure 5). In this model, the GacS/GacA two-component regulatory system receives a yet unknown signal that activates a set of small RNAs [8, 50, 54]. The expression of genes regulated by the GacS/GacA might be mediated through the Rsm pathway [55, 56]. In fact, components of this pathway such as the three small RNAs RsmX, RsmY and RsmZ and two RNA-binding proteins (RsmA and RsmE) were found in the genome of P. syringae pv. syringae UMAF0158 (Unpublished data). Transcriptional analysis of the mgo, mbo and gac genes showed that the mbo genes were markedly down-regulated in both the gacA and mgoA mutants. On the other hand, the transcriptional levels of mgoB and mgoA, also showed down-regulation in the gacA mutant, indicating that the mgo operon is also under regulation by the GacS/GacA two-component regulatory system. These data suggest that GacS/GacA is regulating the mbo operon expression via the mgo operon, however direct regulation of the mbo operon by the two-component regulatory system gacS/gacA cannot be excluded (Figure 5). Proposed model for regulation of mangotoxin biosynthesis in P. syringae pv. syringae. In this model, GacS/GacA two-component regulatory system activates directly or indirectly the transcription of the mgo operon. And the mgo operon could synthetize a positive regulator of the mbo operon transcription. The mbo operon produces mangotoxin which acts as virulence factor. Transcriptional analysis with a lacZ fusion on the promoter of the mbo operon (P mboI ), revealed that the product of the mgo operon could acts as positive regulator of mbo transcription. Interestingly, the pvfC gene (homologue of mgoA) is considered a regulator of virulence in P. enthomophila, but appears not to be part of the GacS/GacA regulatory cascade . In strain UMAF0158, introduction of the mgo operon in a gac mutant could not restore mangotoxin production or mbo-promoter activity, suggesting that next to the mgo operon, additional factors are regulated by the gac system that influence mangotoxin production. It is worth noting that P. entomophila and P. syringae pv. syringae harbor two different genetic backgrounds, adapted to different environments. The first is found in diverse environments such as soil, aquatic ecosystems, rhizosphere, and in pathogenic interactions with Drosophila melanogaster. The second is adapted for plant infection and epiphytic survival . Therefore, the regulatory roles of these orthologues can substantially differ between these two Pseudomonas species. On the other hand, the fact that both PvfC and MgoA are involved in the regulation of virulence could indicate that in other Pseudomonas spp. these factors would be involved in the regulation of virulence and/or secondary metabolite production. Phylogenetic analysis of MgoA and the adenylation domains suggested an evolutionary specialization of this protein into the Pseudomonas genus. In this context, it is worth noting that the transformation of the mbo operon under the expression of its own promoter only confers mangotoxin production in the P. syringae group and not in the P. fluorescens group. Therefore, it seems that the NRPS MgoA is involved in different signal transduction pathways depending of the Pseudomonas species. In the case of P. syringae, MgoA appears to activate mangotoxin production. It remains to be studied if MgoA is also involved in the regulation and production of other antimetabolites in the P. syringae group, such as tabtoxin and phaseolotoxin. The positive regulation of the mbo operon promoter activity in the presence of the mgo operon in Pf-5, combined with the lack of detectable amounts of mangotoxin suggests that additional factors for mangotoxin biosynthesis or its export are not present in the P. fluorescens group. In summary, for P. syringae pv. syringae UMAF0158, the GacS/GacA two-component system regulates transcription of the mgo and mbo operons and thereby mangotoxin biosynthesis. At the same time, the mgo operon product seems to act as a positive regulator of the mbo operon. The proposed model for mangotoxin biosynthesis is a simplified and initial overview of the interaction between the gac, mgo and mbo gene products based on the results obtained in the current study. This is the first evidence of the interplay between MgoA and the GacS/GacA two-component regulatory system in the regulation of the mangotoxin biosynthesis. We the authors hereby declare that the research performed with plants has been conducted in accordance with institutional, national and international guidelines. This work was supported by grants from the Regional Government of Andalucía (Spain), grants from CICE - Junta de Andalucía, Ayudas Grupo PAIDI AGR-169, and Proyecto de Excelencia (P07-AGR-02471) and Plan Nacional de I + D + I del Ministerio de Ciencia e Innovacion (AGL2011-30354-C02-01) cofinanced by FEDER (EU). Plan Propio of the University of Málaga funded a stay of VJC in the Wageningen University, The Netherlands. This is publication No. 5584 of the Netherlands Institute of Ecology (NIOO-KNAW). VJC was supported with a fellowship from Junta de Andalucía, Spain, and EA with a JAEDoc grant from the CSIC, which was co-financed by ESF. We also thank Cayo Ramos and his group for their help in this research. We the authors hereby declare that there is no conflict of interests concerning this manuscript. VJC, MV, EA, AV, JMR and FMC conceived the study. VJC and EA did all the cloning and genetics of this study. VJC and MV did the Q-PCR experiments and analysis. VJC and JAG did complementation and reporter construct experiments. JMR and AV supported the research. VJC, MV, JMR and FMC wrote the manuscript. VJC, EA, MV, AV, JMR and FMC coordinated and critically revised the manuscript. All authors read and approved the manuscript.